Point Lobos marks the north end of the Big Sur coast, as south of here, once past the small town of Carmel Highlands, the next 90 miles have no towns, just countless cliffs, coves and beaches, linked by California Highway 1. The point is small, just a mile long and a mile wide, but contains an extraordinary variety of scenic features, plants, birds and marine animals. The shoreline is formed by a mixture of sandy or pebble beaches, rocky coves, small islands and sheer cliffs, while inland are several bushy knolls, patches of pine/oak woodland, flower-filled meadows and grasslands. Varied plant communities include coastal scrub, coastal prairie, cypress forest and pine forest. 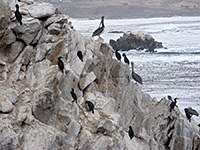 The land is inhabited by up to a dozen types of mammal, many bird species, and (in season) abundant monarch butterflies, some of the islands are home to thousands of pelicans, gulls and cormorants, while other rocks provide a resting place for sea lions. Gray whales pass by in late winter and the underwater world harbors a rich variety of plants and fish. 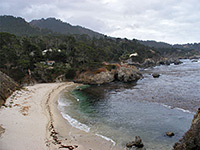 Point Lobos is a major diving destination and popular for many other types of recreation - photography, landscape painting, jogging, sunbathing, swimming, picnicking, wildlife-watching and hiking. The only activity not possible is camping, as the reserve is too small and delicate to have a campsite; for this there are paid sites along Carmel Valley or further south along the coast, and free sites in the mountains of the Los Padre National Forest to the east. It was landscape artist Francis McComas (1875-1938) who described Point Lobos as 'The Greatest Meeting of Land and Water in the World', a description that many of the today's visitors would agree with. 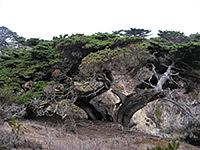 The entrance to the reserve is along Highway 1, two miles south of Carmel-by-the-Sea, where the road runs through a patch of woodland. There is plenty of parking along wide verges on both sides of the highway, though most people drive into the park, along its 2 miles of road that lead to various beaches, overlooks and trailheads. However, vehicular entrance costs $8 while walk-ins are free, and as no part of the point is more than one mile from the highway, it seems best to leave cars by the main road. Busy summer days may see the park reach maximum capacity for vehicles, though people can always enter on foot. All major sites can be visited in 2 to 3 hours of easy walking - in addition to the roadway, the area is crossed by many short, well-signposted trails, one following all around the promontory, close to the shore, several crossing the hills and woods inland, and other short spurs to beaches and overlooks. 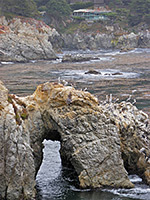 For a small piece of land, Point Lobos has an unusually large number of recognized features, with every little cove, beach and hill having its own name, and all places are reachable along the footpaths. The reserve is open from 9 am to half an hour after sunset and has few facilities, just a small museum at Whaler's Cabin and an information cabin at Sea Lion Point. 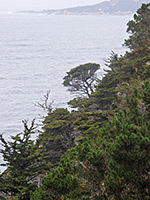 Past the entrance booth, the first path on the right leads to the northern section of the reserve - through pine trees, some draped with wispy fronds of lichen, and occasional cypress trees, then across the flowers and grass of Carmelo Meadow to the first sight of the ocean at Whaler's Cove, where choppy, kelp-filled waters wash against low cliffs and a small pebble beach. This is the main site for scuba diving in the park. The east edge of the cove is formed by Granite Point, a rocky, treeless bluff, beyond which the coastline is similar for half a mile to the edge of the reserve, where the rocks give way to sand around San Jose Creek, at the lower end of Carmel River State Beach. The shoreline is more spectacular to the west - a path (the North Shore Trail) climbs from Whaler's Cove over a small ridge to the edge of Bluefish Cove, the most beautiful part of the whole point, where turbulent waves crash over weathered boulders and surge through vertical chasms, framed by colorful, fractured cliffs and topped by twisted, wind-blown trees. (Big Dome), which is densely-covered with pine and cypress trees. The cliff edge hereabouts is generally too sheer and rugged to approach easily. The trail reaches another junction with the far end of the path to Whaler's Knoll - the summit is a short, steep climb away though the hill is covered in bushes, and views in most directions are partly obscured. 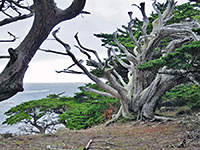 Next is Cypress Grove, location of the main concentration of ancient Monterey cypress trees (Point Lobos being one of just two places where they grow wild on the California coast), after which the path rejoins the park road, at one of the three main carparks. 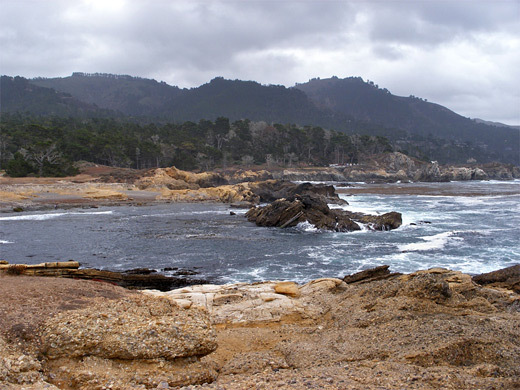 Short trails lead seawards to the westernmost areas - to Point Lobos itself, Sand Hill for a good panorama of the area (see panorama), and to the edge of the ocean at Sea Lion Point. The sea around the cove is particularly rough and churning, known as Devil's Cauldron; just beyond, 400 feet from shore, are several rocks inhabited by many sea lions, whose raucous cries can be heard all over the reserve. This part of the coast has several sandy or pebbly beaches, and a low plateau near the water level, formed of sandstone and conglomerate (the Carmelo Formation). As this area is close to the road, the paths are often quite busy, unlike areas further east. The coastal path follows the east side of the point running beside the road, passing low cliffs and small beaches towards China Cove, a pretty inlet with a sheltered stretch of sand, reached by about a hundred wooden steps. Just south are higher cliffs, steep-sided channels, isolated rocks, several wave-cut arches and a few small islands - a side trail here is one of the favorite spots for painters and photographers. The largest piece of offshore land is Bird Island, home to thousands of gulls and other sea birds. The last part of the coast is Sandy Beach (aka Gibson Beach), also with steps down; this is bordered on the south side by private residences at the edge of Carmel Highlands. A little used path (the South Plateau Trail) leads north from the beach across Monterey pine & coastal oak woodland for half a mile back to the entrance station. One of the closest lodgings to Point Lobos is the 2 storey Best Western Carmel Bay View Inn, which has 59 rooms, many with nice views of the Pacific Ocean half a mile to the west. Also available are several two-room suites. The hotel has a sundeck & outdoor pool, and serves free continental breakfast - the nearest restaurants & shops are along the main road through Carmel (San Carlos St), 2 blocks west. Other nearby hotels: Carmel (3 miles), Monterey (7 miles), Pacific Grove (9 miles), Seaside (9 miles) and Marina (14 miles).